As we said last month, April is usually the start of a spring housing market ramp-up, but this year the new mortgage stress test and rising mortgage rates have continued to be a negative factor. Those expecting an early-stage pick-up marking an end to the payback for sales pulled forward into the fourth quarter of last year have been sorely disappointed. With another month of data released by the Canadian Real Estate Association (CREA) on Friday, it is evident that the disappointing housing picture continued in May. There is no indication of any real rebound in home resale activity through May. National home sales via the Canadian MLS Systems remained little changed from April to May. Having slipped 0.1% lower, it marked the lowest level for national sales activity in more than five years. Slightly more than half of all local housing markets reported fewer sales in May compared to April, led by the Okanagan region, Chilliwack and the Fraser Valley, together with the Durham region of the Greater Toronto Area (GTA) and Quebec City. Declines in activity were offset by gains in Calgary, Thunder Bay, Brantford, London and St. Thomas, Oakville-Milton and the Quinte Region west of Kingston. A small increase in GTA sales also supported the national tally. On a positive note, sales have stabilized suggesting that buyers could be adjusting to the impact of tighter mortgage rules and higher interest rates. 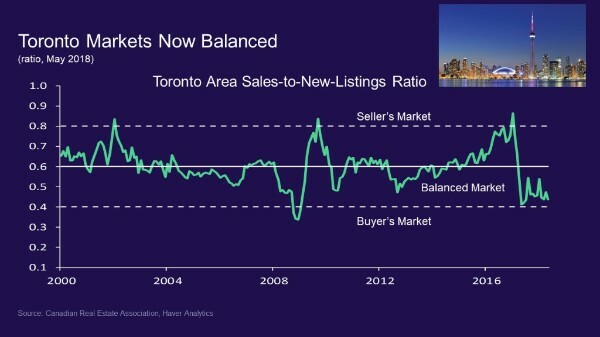 After all, sales did climb 1.6% in Toronto, after falling to recession-era lows in April. Still, CREA cut its 2018 sales forecast to 459,500 nationwide, which would represent an 11% decline from the 2017 pace. In March, the group had predicted a 7.1% slide. Existing home sales in Canada remain stuck at a six-year low of 436,500 units on a seasonally adjusted annualized basis in May, representing the fifth consecutive monthly decline. The stress test, along with higher mortgage rates and new market-cooling measures in British Columbia continue to keep homebuyers on the sidelines. Not even a material rise in new listings (up 5.1%) enticed them back into play. Activity was at a virtual standstill last month in all three of Canada’s largest markets— Vancouver, Toronto and Montreal. 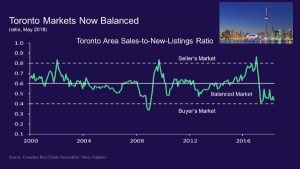 With new listings up and sales virtually unchanged, the national sales-to-new listings ratio eased to 50.6% in May compared to 53.2% in April and stayed within short reach of the long-term average of 53.4%. 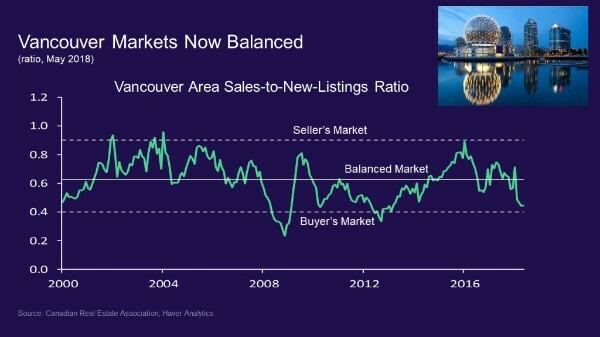 Based on a comparison of the sales-to-new listings ratio with its long-term average, about two-thirds of all local markets were in balanced market territory in May 2018. There were 5.7 months of inventory on a national basis at the end of May 2018. While this marks a three-year high for the measure, it remains near the long-term average of 5.2 months. On a national basis, the Aggregate Composite MLS Home Price Index (HPI) rose only 1.0% y/y (year-over-year) in May 2018, marking the 13th consecutive month of decelerating y/y gains. It was also the smallest annual increase since September 2009. Decelerating year-over-year home price gains largely reflect trends among GGH housing markets tracked by the index. While home prices in the region have stabilized and begun trending higher on a monthly basis, rapid price gains recorded one year ago have contributed to deteriorating y/y price comparisons. If recent trends remain intact, year-over-year comparisons will likely improve in the months ahead. Condo apartment units again posted the most substantial y/y price gains in May(+12.7%), followed by townhouse/row units (+4.9%). By contrast, one-storey and two-storey single-family home prices were down (-1.5% and -4.7% y/y respectively), very much in line with what we saw last month. Benchmark home prices in May were up from year-ago levels in 8 of the 15 markets tracked by the index (see Table below). Composite benchmark home prices in the Lower Mainland of British Columbia continue to trend upward after having dipped briefly in the second half of 2016 (Greater Vancouver (GVA): +11.5% y/y; Fraser Valley: +20.6% y/y). Apartment and townhouse/row units have been mainly driving this regional trend while single-family home prices in the GVA have stabilized. In the Fraser Valley, single-family home prices have also started rising. Benchmark home prices were up by 11.5% on a y/y basis in Victoria and by 18.1% elsewhere on Vancouver Island. Within the GGH region, price gains have slowed considerably on a y/y basis but remain above year-ago levels in Guelph (+3.8%). 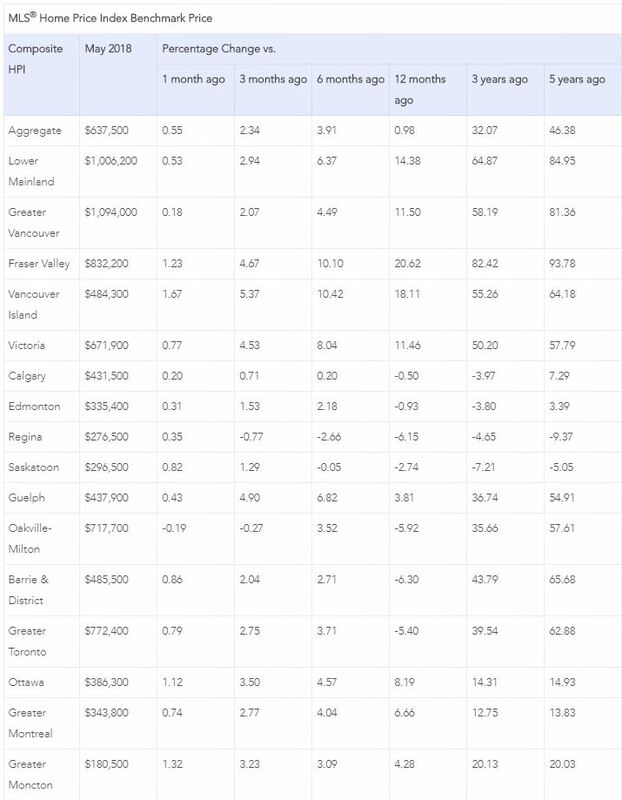 By contrast, home prices in the GTA, Oakville-Milton and Barrie were down from where they stood one year earlier (GTA: -5.4% y/y; Oakville-Milton: -5.9% y/y; Barrie and District: -6.3% y/y). This reflects rapid price growth recorded one year ago and masks recent month-over-month price gains in these markets. Calgary and Edmonton benchmark home prices were down slightly on a y/y basis in May (Calgary: -0.5% y/y; Edmonton: -0.9% y/y), while prices in Regina and Saskatoon were down more noticeably from year-ago levels (-6.2% y/y and -2.7% y/y, respectively). Benchmark home prices rose by 8.2% y/y in Ottawa (led by a 9.5% increase in two-storey single-family home prices), by 6.7% in Greater Montreal (driven by a 7.3% increase in two-storey single-family home prices) and by 4.3% in Greater Moncton (led by a 4.8% increase in townhouse/row unit prices). Owing to the housing slowdown, a general slowing in the Canadian economy and significant trade uncertainty, the Bank of Canada has taken a very cautious stance. However, at their last meeting, monetary policymakers have signalled that a rate hike is coming, likely when they next meet on July 11. Five-year fixed mortgage rates have already risen roughly 110 basis points, while rates for new variable mortgages rose by close to 40 basis points. Since the implementation of new mortgage standards, nonprice lending conditions for mortgages and home equity lines of credit have also tightened. In the Bank of Canada’s recently released Financial System Review, the central bank analysts observed that the updated Guideline B-20, which took effect at the beginning of this year, “is dampening credit growth and improving the quality of new mortgage lending, especially in regions with the highest house prices. For example, because of the new mortgage interest rate stress test, the size of a 5-year, fixed-rate mortgage with a 25-year amortization that a median-income borrower in Canada can qualify for dropped by about $82,000 to $373,000. The stress test will have more significant effects in markets such as the Greater Toronto Area (GTA) and Greater Vancouver Area (GVA), where house prices are higher relative to incomes and low-ratio mortgages are more common.